Accomplished singer and singjay Sophia Squire has released a number of big tunes over the years. Some of her best were released last year, and were featured on one riddim albums such as Bob Locko, Diamonds and Gold and Gyal Season. Now she has a fresh and full EP put out on France’s 149 Records. 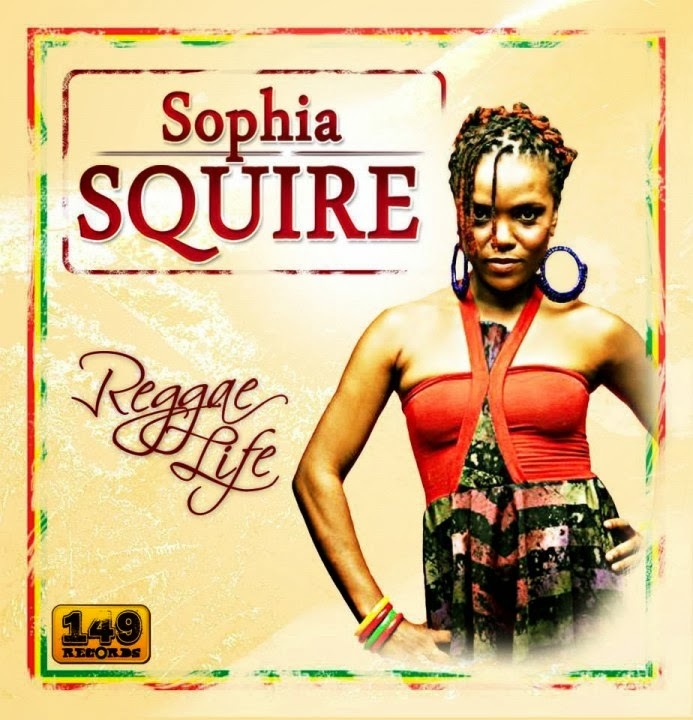 The EP features five scorching tracks where Sophia Squire’s nonchalant and confident singing style is showcased over well-crafted live riddims. Reggae Life is a great set spinning while waiting for new full-lengths efforts from the likes of Queen Omega and Queen Ifrica. Yesterday I came home from a three week holiday in the beautiful islands of Trinidad & Tobago. To me, T&T were the islands of steel pan, calypso and soca. But I was wrong. Reggae is a strong force on the islands and soca is mainly played during carnival season, which starts in late December and usually ends in March. The rest of the time, it’s all about reggae. Before I went I knew that Franz Job and I-Sasha were from T&T. When I met people in the villages I found out that Marlon Asher, Queen Omega and Jamelody also originate from T&T. As well as Khari Kill and Million Voices, and probably many more. However, the reggae tunes that I heard during my visit were Jamaican productions. Most popular riddims at the time seemed to be City Life and Cardiac Bass. Two great riddims that I’ve also played a lot during 2010. Out of all T&T reggae artists that I know of, Queen Omega has been the busiest with three album releases. She has recorded a lot with European producers such as Bost & Bim with whom she dropped the lethal Jah Dawta on the Soprano riddim. Marlon Asher is probably the best know artist from T&T due to his hit song Ganja Farmer included on The Biggest Reggae One Drop Anthems 2006. The only reggae artist from the smaller of the two islands – Tobago – seems to be Franz Job, who now resides in London. In 2009 he dropped the masterful Babylon is Dead album with notable songs Country and The Country Boy Song. He is set to release his sophomore album in 2011 and has also started working with UK mastermind Curtis Lynch. If you’re curious about some Trinibagoan artists – check out ten suggestions below. Most of them are easy to find on iTunes. Seven of the tunes are complied in the Spotify playlist below. 45an är död. Leve 45an. För många – även för mig själv – har tyvärr den så kallade sjutummarn ”45an, eller sjuan” förpassats till en tynande tillvaro. Personligen älskar jag vinylskivor, men har aldrig fastat för singelformatet. Det har stundtals varit en smula problematiskt, eftersom reggae till stor till är, och har alltid varit, en genre som bygger på singlar. Lösningen har ofta blivit samlingsplattor. För många är dock sjuan fortfarande kung i skivbackarna. Exempelvis för BMC, som satt ihop en podcast med namnet Nothing can touch the 45. Den nya podcasten inleds ståndsmässigt med Ray Darwins Nothing can touch my 45. Inledningsspåret sätter ribban högt, men i vanlig ordning lever BMC upp till de högt ställda förväntningarna. Det finns otroligt många starka spår i den här mixen. Ska jag välja några som sticker ut lite extra får det bli Jah dawta med Queen Omega, Serious med Jahmali och Child molester med Assassin. Utöver dessa relativt nya namn, så väver BMC in gamla rävar som Big Youth, John Holt och The Ethiopians. Ladda ner podcasten redan i dag så är helgen räddad.